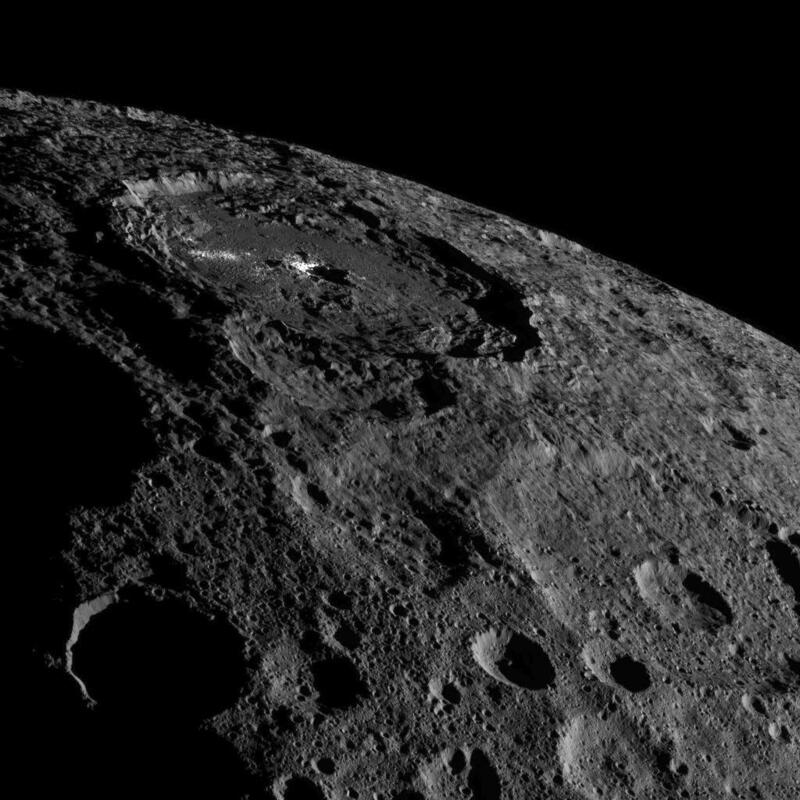 NASA’s Dawn spacecraft, now in a higher orbit around Ceres, captured breathtaking new views of the dwarf planet, including one of Occator Crater which is the site of the uncanny bright spots that have intrigued scientists for more than a year and a half. 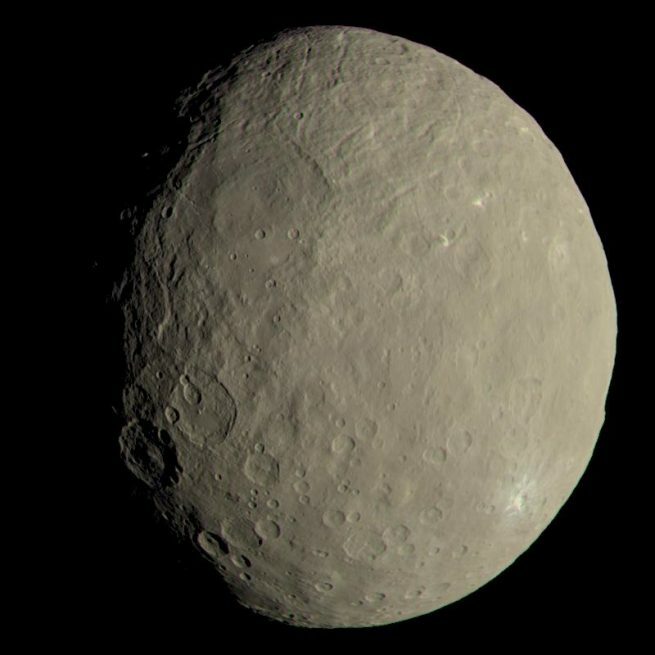 The Dawn team released the new images, along with a processed one that shows how Ceres would appear in color when viewed up close by the naked eye. For its fifth science orbit, Dawn spiraled from close-in to about 920 miles (1,480 kilometers) above the surface in early October, where its instruments imaged Occator Crater from a position in which the angle of the Sun is different than it has been in any earlier photos. In the above image, taken on October 16, the limb of the dwarf planet is visible. At the center of the picture, Occator Crater and its bright deposits are prominently displayed. Close to the limb, other bright but less reflective areas can also be seen. The large crater was likely formed when a meteorite impacted Ceres several million years ago, stirring up rocky material that now lies nearby outside the crater. After more than a year of speculation, scientists surmise that the bright deposits within Occator Crater are salts which were dissolved in a liquid that was pushed to the surface following the impact. That liquid subsequently froze, then sublimated into gaseous form, leaving the salt deposits behind. “This image captures the wonder of soaring above this fascinating, unique world that Dawn is the first to explore,” said Marc Rayman, chief engineer and mission director of Dawn at NASA’s Jet Propulsion Laboratory (JPL) in California. Since entering orbit around Ceres in March 2015, Dawn has spotted ice volcanoes on its surface and determined the dwarf planet to be a geologically active world. Occator Crater, which is 57 miles (92 kilometers) wide and 2.5 miles (four kilometers) deep, is one of several sites on Ceres with evidence of recent geological activity. 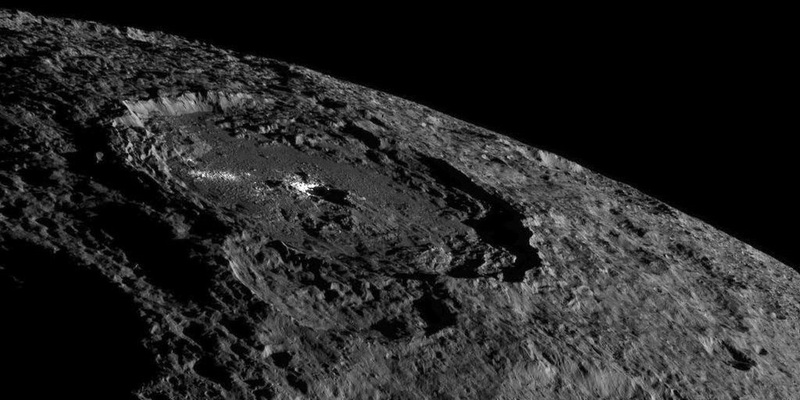 From Ceres’ density, scientists know it contains a lot of water and could possibly harbor a subsurface ocean. The other image released (shown right), processed to appear in color as Ceres would to the human eye, was created from several photos that Dawn took in 2015 during its first science orbit, using its camera’s red, green, and blue filters. Scientists at the German Aerospace Center in Berlin based the colors in the image on Ceres’ reflection of light at various wavelengths. Tens of thousands of photos of Ceres have been taken during Dawn’s five science orbits, including close-ups taken just 240 miles (385 kilometers) from the surface, closer than the International Space Station (ISS) orbits the Earth. The spacecraft headed toward a sixth, much higher science orbit on November 4, which will take it more than 4,500 miles (7,200 kilometers) above the small planet’s surface. Now in its extended mission, Dawn will use this orbit to fine-tune measurements taken in all its previous orbits of Ceres. It will also use its gamma ray and neutron spectrometer, which have been studying Ceres’ composition, to study radiation produced by cosmic rays. The ability to separate signals coming from outside the planet from those originating inside it will improve the accuracy of data collected. Through a new technique in which Dawn’s ion engine thrusts in the same direction the spacecraft is going, engineers can reduce the amount of hydrazine and xenon fuel needed to spiral to the higher orbit, which Dawn should reach in early December. Dawn is the first spacecraft to orbit two separate planetary bodies. Launched in 2007, it orbited and studied protoplanet Vesta between July 2011 and September 2012 before departing for Ceres.